Video games are unique among many forms of entertainment because they require their players to take action, to complete objectives, and to seek out the information they need in order to solve given problems. In this way, playing video games can be considered analogous to having a job: the degree of an individual's personal success or failure depends on their problem solving skills, their ability to adapt to changing circumstances, their capacity to grow, and their drive to succeed. It's only fitting, then, that certain video games would come into creation that present players with tasks which mirror those we see in everyday life, be it from our jobs or from the chores we have to do around our homes. These are things we're distinctly familiar with, after all, so it should come as no surprise that they've been introduced into video games. What is surprising, however, is just how much fun labor can be when it's performed within a virtual environment. More than just a reflection of life's many chores, work-related games put an enjoyable spin on real-world tasks that often feel tedious, repetitive, or downright boring — they're a celebration of both labor and of everyday life. So regardless of whether you plan to hit the town or hit the couch, celebrate this year's Labor Day holiday in style and in irony by kicking back and diving into our favorite mobile and handheld work-related video games. There are few jobs in the technology industry that are as tedious and potentially-frustrating as computer programming. Simply earning the language of code is often enough to turn many aspiring programmers away, and that's to say nothing of having to use that language to perform complex tasks. However, job-oriented games have the surprising ability to turn mundane work into interesting gameplay mechanics. It doesn't seem logical, but it works, and in many cases, the more monotonous the job, the more exciting the game version of that job becomes. Perhaps that's why developer Tomorrow Corporation created Human Resource Machine, a title that tasks players with spending years of their virtual lives manipulating data using nothing more than a set of basic commands. Successfully turning the game's given inputs into correct outputs earns the protagonist a promotion, and moving up the corporate ladder means that players will have to solve increasingly-difficult tasks using the same basic tools they had to begin with. Even though work and life-simulation games are a rare breed in and of themselves, Papers, Please stands apart from other titles in the genre due to its strikingly-meticulous gameplay and deliberate lack of overt action. The title tasks players with allowing or disallowing NPCs from entering the the fictional country of Arstotzka based on their provided credentials, and succeeding means that players must double-check all provided information against a set of increasingly-demanding rules for admission that are changed with each in-game day. Players can contest discrepancies in immigrants' physical descriptions, demand fingerprints, review past records in order to deny entry, or even have applicants arrested based on falsified information or their criminal backgrounds. Papers, Please might not be everyone's cup of tea, but the game still manages to be surprisingly addictive, especially for detail-oriented players. It even has a branching storyline that allows players to unlock one of twenty different endings, some of which will having drastic effects on the future of Arstotzka itself. Most game fans are no doubt already familiar with The Sims, the immensely popular life simulation series from the brilliant mind of creator Will Wright and the development team at Maxis. 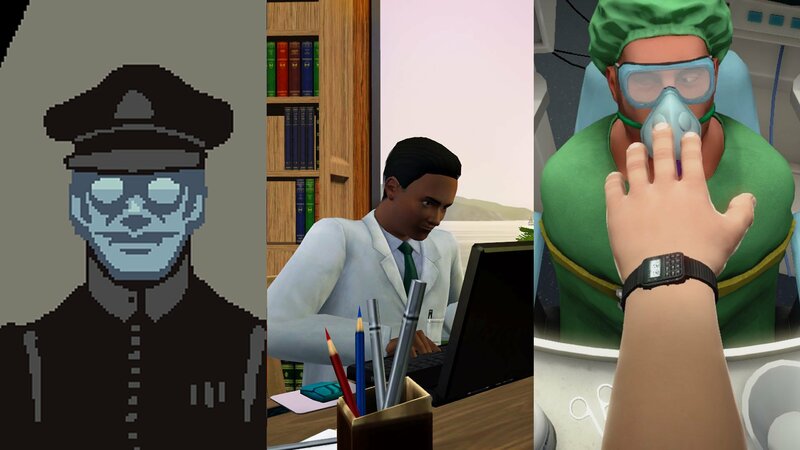 All of the games released in the mainline series so far task players with creating an avatar, which may or may not represent themselves personally, and strike out into the virtual world to be as lazy or as ambitious as they choose. Sims can become writers, or doctors, or janitors; they can raise a family or adopt a dog, or even sit at home in their underwear watching TV all day. There's something unusually addictive about the level of micro-management The Sims offers players: just like in real life, Sims have needs that players must attend to, including everything from eating breakfast or cleaning the kitchen to paying bills and even bathing. In a nutshell, the gameplay sounds totally menial -- but in practice, it's surprisingly entrancing. Small wonder that the series has proven so successful, with four main entries and six spin-off titles so far, including the recent release of The Sims Mobile. Harvest Moon is one of the earliest progenitors of the simple farm life genre, and through the years the series has evolved not only in breadth and in scope, but also in title: Harvest Moon, the iconic franchise known in Japan as Bokujo Monogatari, is now known as Story of Seasons. Despite the name change, the core recipe hasn't much changed from its simple and addictive formula, which tasks players with tilling soil, planting seeds, and renovating their homes and land in an effort to yield ever-increasing amounts of crops. All of the series' staple elements are present in Trio of Towns, the latest portable entry to the decades-old series, but as the title implies, players are now able to visit three different towns in order to procure supplies and court favor with the locals. With unlockable recipes, new plots to buy, and new structures to build, Story of Seasons: Trio of Towns is one of the biggest simple farm life titles to date, and an excellent example of how mundane tasks can translate into an exciting virtual experience. While many of the titles on this list correspond to jobs that most people are familiar with, Surgeon Simulator stands apart because it presents a workplace experience set within a highly-skilled profession. Instead of offering players the chance to drive lorries or manage a restaurant, Surgeon Simulator allows players to get their hands bloody by undertaking a number of surgical procedures, with each one more drastic than the last. It's a bit misleading to call it a surgery simulator, though — while players certainly can try to keep their act together and cut open virtual patients with precision and professionalism, that isn't exactly the point. Instead, the developers at Bossa Studios implemented a control system that's efficient enough to work but just wonky enough to twist serious procedures into acts of comedy. Far from a realistic surgery experience, this gameplay style transforms the tensity inherent to high-profile medical procedures into something that's simultaneously both challenging and stress-relieving. No list of work-related games could be complete without Cooking Mama, and the fifth entry to the series, Bon Appétit, is the latest and greatest in the ten-year series so far. Like in other Cooking Mama titles, Cooking Mama 5 tasks players with preparing and cooking dishes in a series of minigames that culminate in a completed entree. Chopping, slicing, flipping, and other cooking motions are handled using the device's touchscreen, and getting the best results often involves both timed and twitch-based reactions. There's more to the game than just cooking, too: Cooking Mama 5 also includes a number of minigames based on household activities and chores such as gardening, studying, doing crafts, completing homework, and serving dinner to guests. The game allows players to create up to 60 different recipes, and there's even an option to replay specific cooking procedures, like rolling dough or spreading icing, which gives true culinary connoisseurs the opportunity to perfect their trade. If you enjoyed this list, be sure to browse Modojo's Best Games category, where we've collected lists of our favorite titles across the hottest genres and the most popular consoles.